It seems like ages ago that I was in Estonia, but it was actually just a month ago. I don’t know where the time goes. I do realize that I’m a terrible travel writer if a whole month has gone by and I still haven’t written about this trip. I have uploaded 488 photos to flickr but haven’t put names or labels to them, nor have I edited any of them. It is such a daunting task! Maybe you will enjoy them in their raw uploadedness. I had a hard time deciding what the header image for this post should be, but finally decided that this one captures the trip for me – knitting, wool, outdoors, rustic and natural, friendly and fun. 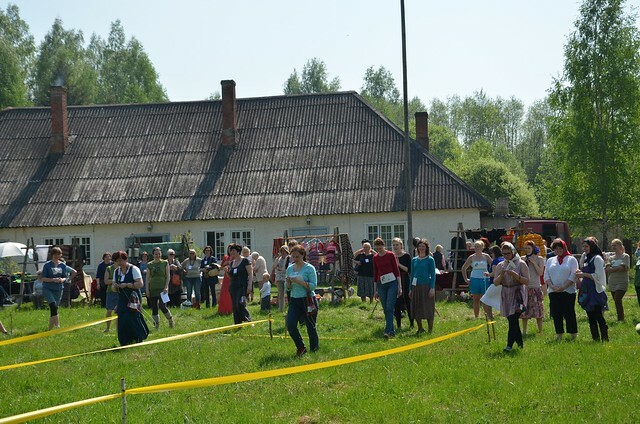 This photo was taken at the yearly Heimtali Fair. 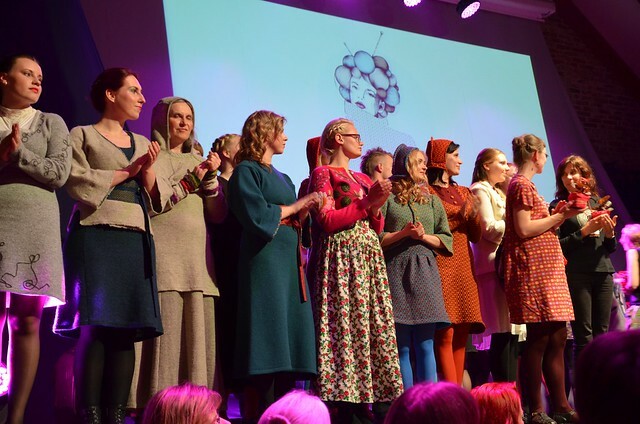 I went to Estonia to participate in the International Conference: Traditional Knitted Sweaters around the Baltic Sea. When I say “participate” I really mean be there and watch and listen and learn. It was not a big event. I’m guessing only about 200 – 250 people attended. 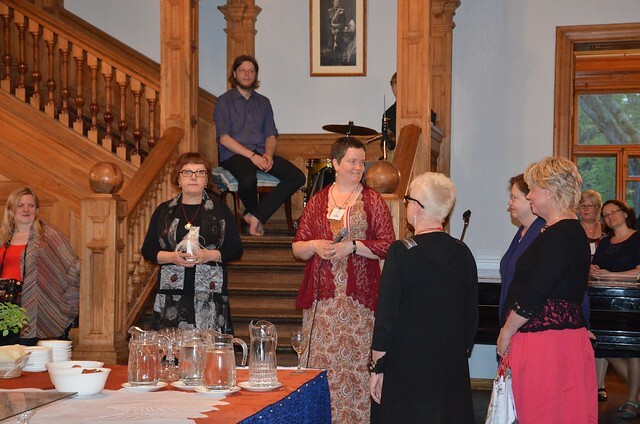 Those who gave presentations were from Norway, Sweden, Finland, Estonia and the Shetland Islands. There were people in the audience, like our little group, from the Netherlands, German, Denmark, and I think Latvia. I felt privileged to be there among these dedicated, serious scholars and artists. There were of course those who came who weren’t so serious, and just enjoyed being at the event. 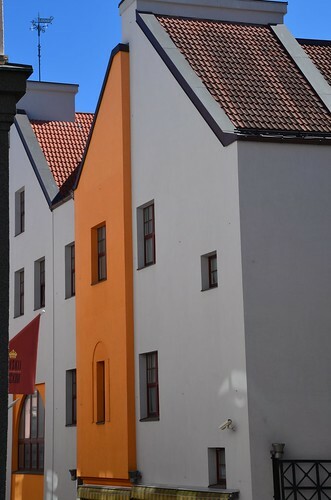 I have so many photos of lovely Estonia, but I will leave you to look through them on flickr (see link above) and will just show you one or two photos of each part of the trip. Keep it short and sweet. J. and I traveled together and arrived in Tallinn Wednesday before the event. The weather was cool but sunny and we walked around the Old Town. It’s beautiful and extremely well maintained, in a sort of Disney-ish way, but still it is a working city center. 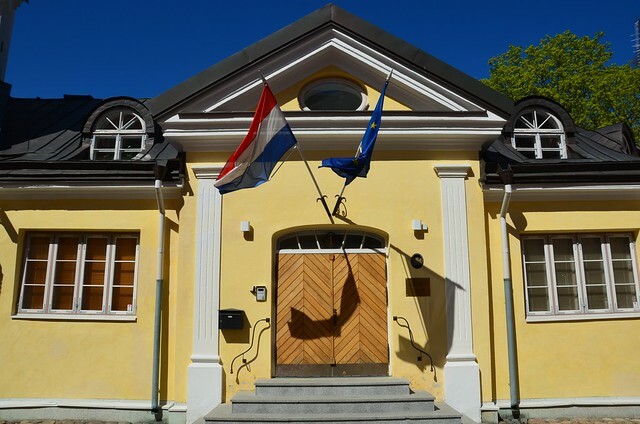 There are foreign consulates here, and museums, and offices in these old buildings. They do cater to the tourist (huge cruise ships dock each day, spewing out tourists with cameras around their necks), but in the evenings when the tourists have gone back to their cruise ship, the locals come out to party in the pubs. 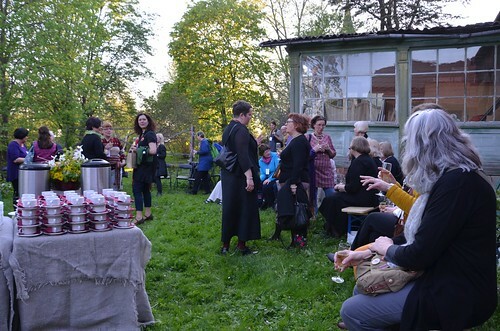 On Thursday all the travelers who needed a ride from Tallinn to the event in Viljandi met up to get on the tour bus organized for us. There were the other Dutchies, plus some others from Sweden, Norway and Finland. We drove through the lovely countryside for two hours and then were dropped off at our accommodation. Everything was so well organized! Buses were always waiting for us at the right time to get us to the right place, all during the 3 day event. It was flawless and took all the stress out of travel in a foreign country. J & I stayed in the place farthest away from the town, in little houses in the woods. It was charming and perfect. We barely had time to drop our bags and grab a bite to eat (above photo) when we were hustled onto the bus, back to town, for the fashion show. 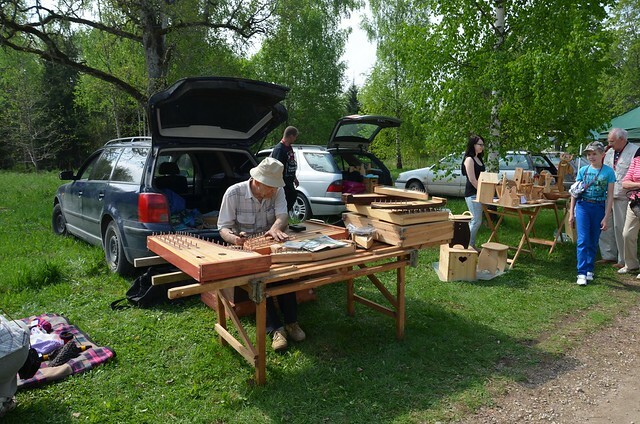 This was a show put on by the Viljandi Culture Academy students. There were more than 50 students modeling their work, walking the runway to music that was also pretty amazing. It was live streamed that evening too! At this Academy students study textiles, woodworking or metalworking. It was so impressive. I took loads of photos, but from my angle sitting on the floor, they just don’t do the show justice. HERE are some of the professional photos taken that night. Since it was live streamed I was hoping to find a video of it somewhere so you could hear the music and see how they danced down the runway, but alas, I can’t find one anywhere. After the show we walked to a small museum in the town and had dinner outside. Just us and the mosquitos. The next morning we were taken by bus to a building on the main street that had an auditorium – main stage with the room below filled with chairs. 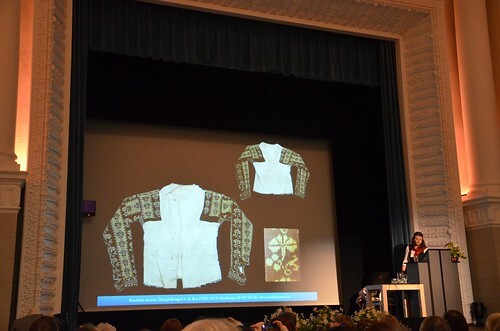 The day was spent watching and listening to experts talk about the history of knitted sweaters in their country. They were historians and artists, known for their research and writing. 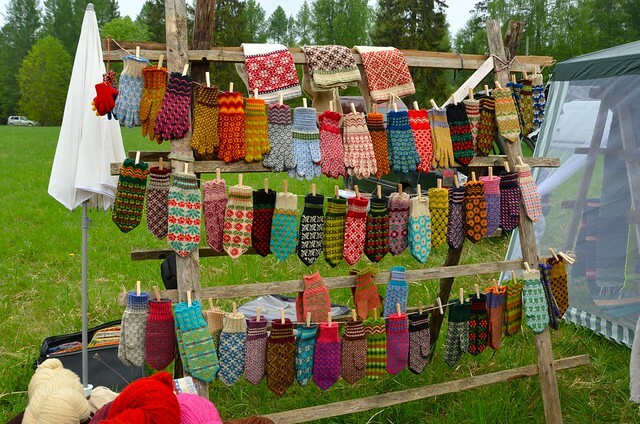 It made me sad that I don’t come from a place with such deep traditions in fiber arts. Even my adopted country has scant to show for knitting traditions. We have a few fisherman’s sweaters and hats, which we most likely copied from our neighbors further north. But the Scandinavians and Baltic cousins! They are not only rich in history, but they also continue to value these skills and knowledge and support it so it will continue. In the U.S., if it don’t turn a profit, it ain’t worth saving, and therefore much of value is lost and forgotten. Friday night we had dinner in what was built as a German Baron’s summer house. 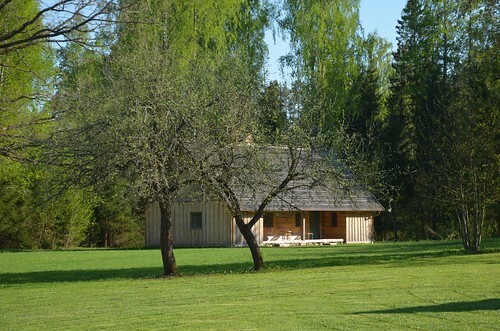 It is now a school building, in yet another school for traditional arts outside of Viljandi. 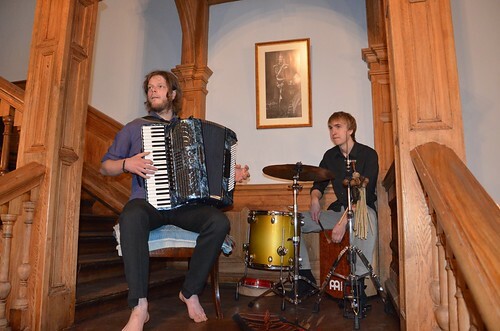 We were also entertained by traditional Estonian musicians. 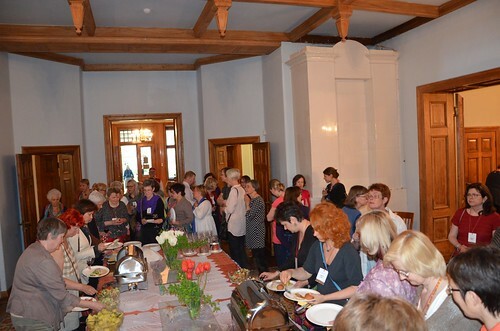 The conference has been held in Estonia for the past 3 years. It will now move to Finland for the next 3 years. This was officially announced after dinner. 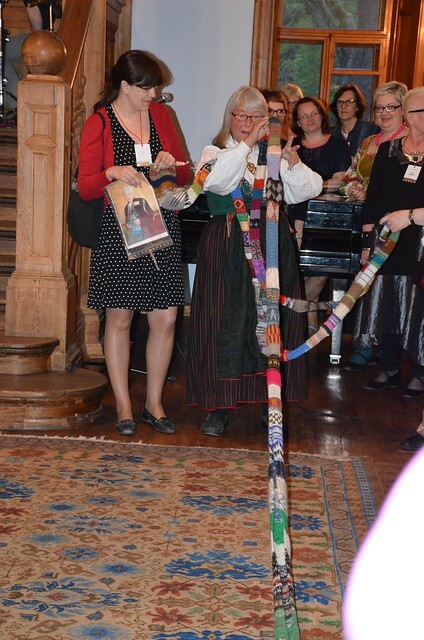 There was also a handing over of a very long knitted piece, the story behind which was kind of explained, but went a little past me. I think you had to be in the In Crowd to know what that was about. 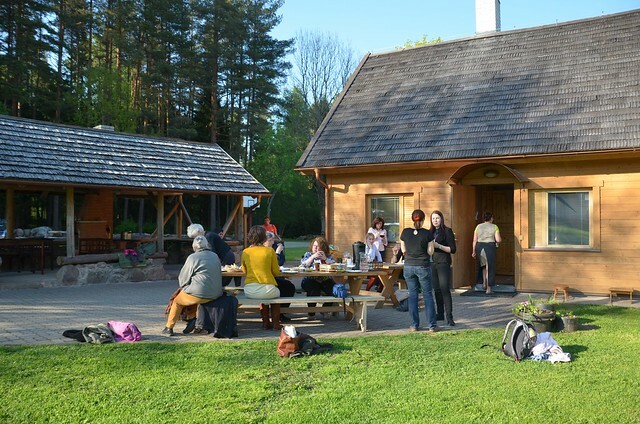 When we got back to our little cabin in the woods on Friday evening, our neighbors from Norway invited us to sit outside and drink some wine for a while. What a nice night that was! It was Norway’s National Day so they were ready to celebrate and sing songs and eat and drink. The next morning we packed up and loaded up in the bus, heading to Heimtali Fair and Museum. 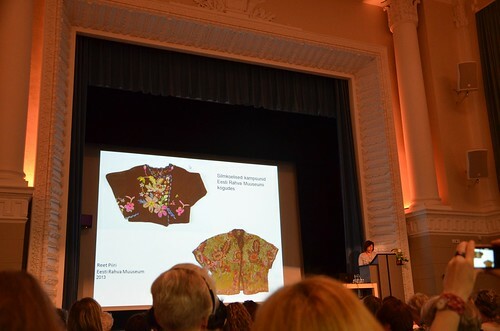 First we heard a short talk by Anu Raud and saw slides of her work, then there were talks by our presenters about where their inspiration comes from. I wish I had been able to see Anu Raud’s work in person – her murals look amazing – but they are currently in a museum in another town. After these talks we were free to wander around the small fair, spend some money, eat some lunch, and watch the walking knitting tag team competition! There were lots of tables with things for sale made from wood, metal, and lots and lots of wool. Later on there were dances by little girls in costumes. As you can see, the sun was shining and it was so hot we searched for shade to sit in. I did buy some yarn here. I couldn’t resist. It was such a bargain! A sweater’s worth of yarn for less than 15 euros! 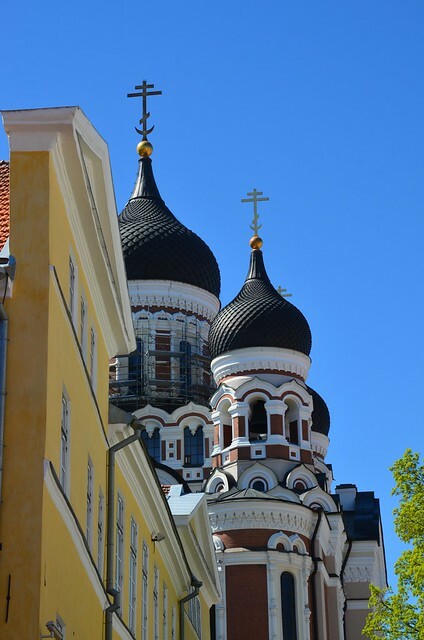 The afternoon came all too soon and we piled back onto the bus and headed back north to Tallinn. J and I spent the night there and visited the Old Town again on Sunday – out last chance to shop and look around. We visited a shop that we had heard about over the weekend. 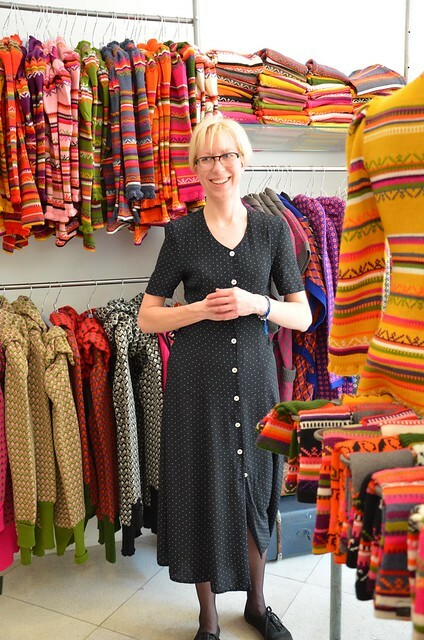 We met the mother of the woman who designs all the clothing in this shop. This photo isn’t the designer (she was sick) but this shop keeper was so friendly and helpful even when we didn’t buy anything. They also had a bicycle covered in knitting in the big front window. Who could resist going in? And that was Estonia in a nutshell! It was a wonderful trip and I’d really like to go back again. The people are all very friendly, it’s beautiful, the food was excellent in the restaurants we went to, and the prices are much much cheaper than Amsterdam. We were lucky with the weather too – while it was cold and awful in Amsterdam, it was warm and sunny here. That and all the knitting – kind of a little paradise. Next Best Kept Secret – the secret it out! wow that looks amazing! 😀 thank you for sharing! I am so glad you posted here and on Flickr about this! I’ve been very curious about it — and I would have absolutely LOVED to be there with you three. 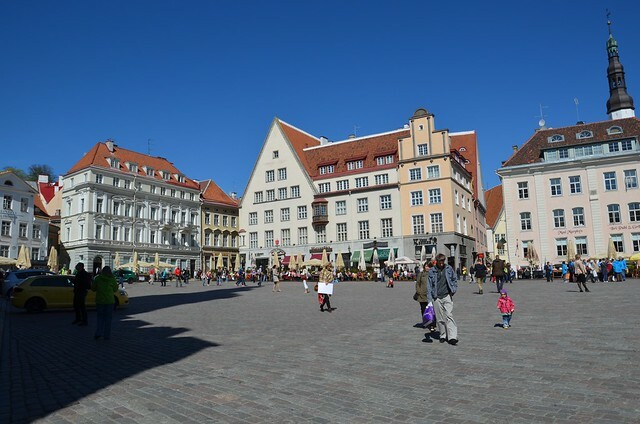 Estonia is pretty high on my bucket list . . .